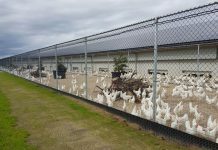 Heaping of used poultry litter reliably induces significant elevations in temperature due to the actions of variety of aerobic bacteria and fungi. Temperatures typically rise to over 50°C in 1- 4 days and may peak at more than 60°C. These temperatures are sufficient to reduce or eliminate a range of pathogens giving rise to the term ’pasteurisation’. A common target for litter pasteurisation is heating to 55°C for a minimum of 3 days. Factors influencing heating potential include carbon to nitrogen ratio, moisture content, oxygen availability and to a lesser extent pH. The provision of bedding material and disposal of spent litter pose large economic and social challenges to the chicken meat industry. Consequently, the practice of reusing litter across successive batches of chickens is widespread in the USA, where the estimated mean interval between full litter cleanouts is 1-2 years. In Australia, estimates of 2% (East 2007) to 30% of chickens are reared on previously used litter. To limit pathogen transfer, used litter may be heaped for varying periods between grow-outs, allowing natural composting processes to generate sufficient heat and ammonia to reduce pathogen load. Hence, the term ‘pasteurisation’ is used to describe this process as its broadest definition describes a process of partial sterilisation using heat, although this process may not meet the narrow definitions applied to food. Pasteurising heats of 50°C and above obtained in heaped poultry litter are due largely to aerobic microbial activity. Aerobic oxidation of carbon substrates releases large amounts of heat, water and CO2 while anaerobic fermentation yields much less energy and CO2 and large amounts of energy rich methane. Aerobic oxidation of glucose produces 677 kcal/mol of energy while anaerobic oxidation produces only 96 kcal/mol of energy. Putrefactive odours are a common by-product bacteria of anoxic and anaerobic composting with sulphur and nitrogen acting as electron acceptors rather oxygen. At an early phase of the composting process (between 20-40°C) the dominant active degraders of organic material are mesophilic/thermotolerant fungi (principally yeasts and moulds) and acid producing bacteria Thermophilic fungi usually appear after 5 to 10 days followed by actinomycetes. Mesophilic microorganisms are killed or inactivated during the initial thermogenic stage (between 40-60°C). The optimal temperature for thermophilic fungi is 40-55°C, with a maximum at 60-62°C. Thermophilic actinomycetes are more tolerant than fungi to high temperatures but at temperatures above 60°C their number and species diversity decreases, and their importance in the degradation process becomes negligible. Thermophilic bacteria are very active at 50-60°C, and at temperatures above 60°C the degradation process is essentially performed by these microorganisms. Heat inactivation of pathogens relies on complex time-temperature relationships. Higher temperatures require shorter periods to cause inactivation. Moist heat and higher levels of hydration are more effective than dry heat. Parasites and their eggs are inactivated more readily than bacteria, which in turn are inactivated more readily than viruses, although there is wide variation and overlap. Heat in the temperature range achieved during thermophilic litter composting is a potentially effective means of inactivating many pathogens including viruses, bacteria, fungi, protozoa and metazoan parasites. Exceptions include prions, bacterial spores, some helminth eggs and certain protozoal cysts. In general, vegetative bacteria are destroyed after 5-10 min at 60-70°C and pasteurisation at 70°C for 30 minutes destroys most pathogens (including viruses) found in sewage sludge. Temperature acts primarily by denaturing proteins. Irreversible protein cross-linking and coagulation is solvent dependent, requiring higher temperatures as material becomes more desiccated. This likely explains both the greater efficacy of moist heat over dry heat and the extended survival of very resistant life forms such as spores, lyophilized virus etc. Viruses are inactivated by a) the breakdown of hydrogen bonds and consequent collapse of the secondary structure of DNA or protein capsid (DNA viruses) or b) a break or change in the nucleic acid chain at a single point (mainly RNA viruses). Regarding bacterial inactivation, the thermophilic temperatures achieved during litter composting are well above the thermal death points of mesophilic pathogens, such as E. coli and Salmonella spp. In several studies enteric bacteria such as Salmonella spp., E. coli, Campylobacter spp., vegetative Clostridum perfringens and Listeria monocytogenes were reduced to undetectable levels by poultry litter composting. The mortality of pathogens during composting is not uniform throughout the litter heap, with many studies reporting the persistence of pathogens at the surface of fresh compost. Regrowth of bacterial pathogens due to recontamination is a risk for open-air composting environments, but this is not a major risk for short-term litter pasteurisation in sheds. In regards to virus inactivation, Newcastle disease virus and avian influenza virus in chicken faeces, feed and litter (in porous nylon bags) were inactivated by day 3 in composting litter. Infectious laryngotracheitis virus was reduced to undetectable levels by normal litter composting for 5 days or heating at 38°C for 48 hours. Walkden-Brown et al. 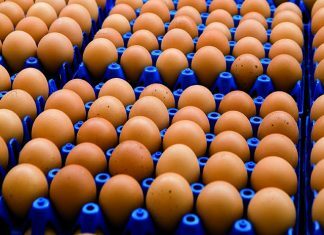 (2010) reported that Fowl Adenovirus type 8 was largely inactivated in litter after 6–7 days of litter pasteurisation while chicken anaemia virus and infectious bursal disease virus were largely inactivated after 6-10 days. Marek’s disease virus retained significant infectivity at days 9–10. 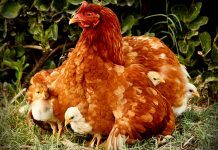 There was little evidence of any litter transmission of infectious bronchitis virus or vaccinal Newcastle disease virus at all. Coccidial oocysts are inactivated after 3 days of pasteurisation. Given this information, the identification of suitable target temperatures and durations for litter pasteurisation is a challenge. The most common target is heating to 55°C for 3 days derived largely from guidelines provided in USA and Australian regulations relating to the inactivation of pathogens in sewage sludges and composts. 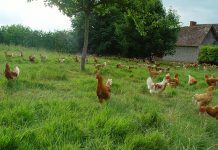 These regulations are summarised below but it should be emphasised that they are not directed at litter pasteurisation, and are generally impractical to apply in full in the short periods available between chicken batches. USA – Environmental Protection Agency (EPA). In its Part 503 Biosolids Rule the 31 EPA differentiates between Class A and Class B treated sludges (EPA 2012). If pathogens (Salmonella sp. bacteria, enteric viruses, and viable helminth ova) are below detectable levels, the biosolids meet the Class A designation. – Class A. Using either the within-vessel composting method or the static aerated pile composting method the temperature of the biosolids is maintained at 55°C or higher for 3 days. Using the windrow composting method, the temperature of the biosolids is maintained at 55°C or higher for 15 days or longer. During the period when the compost is maintained at 55°C or higher, the windrow is turned a minimum of five times. – Class B. 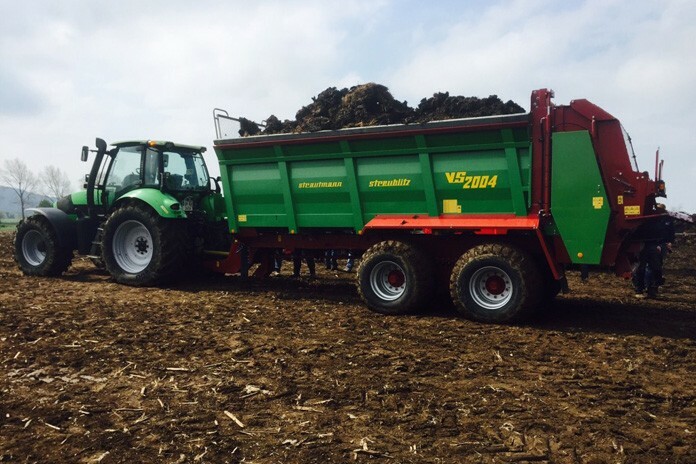 Using the within-vessel, static aerated pile, or windrow composting methods, the temperature of the biosolids is raised to 40°C or higher and maintained for 5 days. For 4 hours during the 5-day period, the temperature in the compost pile exceeds 55°C. – Appropriate turning of outer material to the inside of the compost pile/windrow so the whole mass is subjected to a minimum of three turns with the internal temperature reaching a minimum of 55 ̊C for three consecutive days before each turn. – Where higher risk materials are included in the compost feedstock (including manures, animal waste, food or grease trap wastes) the core temperature of the compost mass shall be maintained at 55°C or higher for a period of 15 days or longer; and during this period of high temperature the compost pile/windrow shall be turned a minimum of five times. A carbon to nitrogen ratio (C:N) between 15 and 30 is recommended. Above 30 microbial growth is impaired. Below 15, high temperatures are achieved but nitrogen is in excess and given off as ammonia. Broiler litter typically has a C:N of 10-15 and this ratio reduces with increased litter reuse. Adding a high C-low N source will reduce ammonia emissions. The optimum moisture content for compostable material is between 40 and 60%. Excessive moisture limits porosity and oxygen availability and insufficient moisture inhibits microbial growth. Used poultry litter typically has a dry matter content of 20-35%. Our research in Australia has shown variable temperature responses for moisture addition to litter, with significant temperature responses only seen in very dry litter (<20% moisture content). In the USA the on-farm impact of moisture addition to litter with an initial moisture content of 25-26% did not produce the expected increase in temperature and created later issues with ammonia production, wet litter and caking. Excessive ammonia production following the addition of water to litter (to create 28-34% moisture content) has also been observed in Australia. As such, a potential relationship exists between the C:N ratio and moisture content of litter leading to excessive ammonia production and the consequent inhibition of thermophilic bacteria. Pasteurisation is largely an aerobic process and oxygen can become limiting if particle size is small and porosity poor, or if moisture content is too high. Compression in large heaps will reduce porosity and oxygen availability deep in the heap. Turning increases oxygen availability but cools the heap producing a saw-tooth like temperature profile. Compost microorganisms operate best under neutral to acidic conditions, with pH in the range of 5.5 to 8 although pH up to 9 supports adequate microbial composting. Composting litter tends to be slightly alkaline (pH > 8) and to acidify slightly during the process. Ammonia production increases rapidly as pH increases above 8. The composting process is somewhat self-buffering and deliberate modification of pH is rarely justified. The major factors affecting the temperatures generated in heaped litter are the C:N ratio and the availability of oxygen and moisture. These can be manipulated in practical ways to optimise temperature outcomes in the brief time usually available to pasteurise litter between batches of chickens.